Not as some impossible-to-finish half-project, however. Think of it as "Z80 Workshop, but it works properly"
I've been working on it for a couple of days, and so it's still not quite complete, but the basics are there - file loading/saving and compiling. The underlying structure is much tighter than in Z80 Workshop - half due to .NET, half due to me doing things more sensibly. ;DESCRIPTION:This routine does just the same job as LDIR, but is expanded so you can (for example) perform the same operation on every byte as it is copied across. 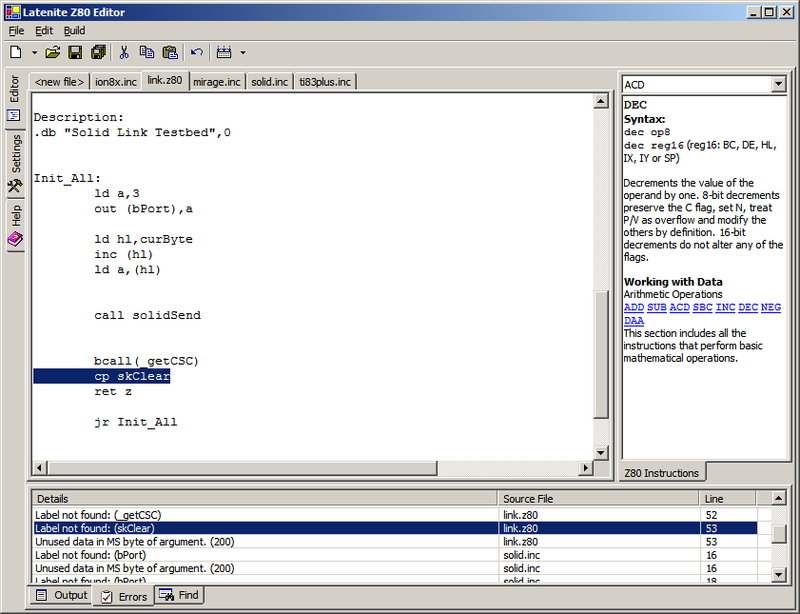 ;DESCRIPTION:This routine inverts the image in the graph buffer. ;DESCRIPTION:This routine decompresses BC bytes of data (RLE compressed, runs marked with $91) located at HL into DE. Note that BC is the size of the original uncompressed data. I'd also like a full list of ALL the TI-83 Plus ROM calls, but getting a decent list in a sensible format might be tricky (and I'm not going to populate a database table by hand). Last edited by benryves on Mon 20 Aug, 2007 9:44 am, edited 15 times in total. Are you gonna support external 'help' files for calls to a library. Like importing the GPP library from duck with a helpfile, so you get a helpbox on every call? Whoops, yes, it will (I forgot to mention it). The way this works is that any external addons are just slotted into a folder and the program detects them itself. For example, any .bat file in the "compile" folder appears as an option in the build menu, and when run the program runs the batch file with %1 = program name (no extension), %2 = program name (extension), %3 = compile base folder. The help files for each library will just be simple CSV files. These will be extra tab pages on the "Z80 Instructions" bit on the right. Looking good! I'd like to see syntax highlighting though I've made UltraEdit syntax highlighting definitions (from some list I got somewhere, don't remember where unfortunately, so I can't give credit), you can have it if you want 'em. And maybe it would be a nice idea to link the code snippet box to the online codebase kv and I have been working on a bit..? How could he not know the future of emulation!!! I haven't bothered on the grounds that with ASM it's pretty clear what's what and it's virtually impossible with the standard VB controls (even the shiny .NET ones). kv: What do you mean about integration with PindurTI? If you drop the EXE or a shortcut into the "tools" folder it'll appear in the tools menu of the editor - and if you mean automatically start it up and send the file to it... you'll have to see. Now a hotkey to compile and launch the emu (if there are no errors) would be handy . One thing I must warn you is this: I don't have very good access to the internet at the moment, so updates will be slow. Unfortunately, I think source highlighting is right out - it's pretty much impossible with the standard controls (I'd have to start using a rich text box, which adds all sorts of horrible complications). Also, I'll make sure that you guys get a play with it, that we get some good snippets/help files sorted out (I'd really appreciate CoBB's help with some of the Z80 instructions stuff - it's currently a botched copy of the HTML stuff, so some of them say things like "this instruction is just like the above instruction, but HL is decremented each time" - whilst this looks great and much clearer than a full description in his HTML pages, it's a bit confusing when you can't see what the "above instruction" was! I'm thinking about rewriting the instruction descriptions anyway. Now that I implemented an almost complete Z80 emulator I know much more details. Will there be app support? Multipage? Support for more than 5 pages would be great, say around 90 or so.